Ronald Shiffman, now professor emeritus at the Pratt Institute and co-founder of Pratt’s Center for Community Development, was appointed to the newly-expanded City Planning Commission in 1990, and was present for the adoption of the Fair Share Criteria. He told Gotham Gazette that the creation of the criteria was compelled in large part by increasing concern over the then-nascent homelessness crisis and the early power of the emerging environmental justice movement. Shiffman also said that the criteria were kept intentionally vague, so as not to “tie the city’s hands” when shelters and other facilities needed to be sited quickly, and noted the difficulty of achieving an equal distribution of burdens. According to Shiffman, the Fair Share Criteria began to lose power as more city services and facilities were taken over by not-for-profit and private entities, because the accountability and mapping requirements set forth by the criteria apply to only city-owned and operated facilities. At the same time that the newly-created criteria sought to compel communities to do their part to shelter fellow New Yorkers, the environmental justice movement saw the criteria as a tool to help protect low-income communities of color from becoming dumping grounds for waste processing stations. Eddie Bautista is the director of the New York Environmental Justice Alliance; in 1990, when the criteria were enacted, he was the Director of Community Planning with the New York Lawyers for the Public Interest (NYLPI). Bautista said that the criteria emerged at the same time that the environmental justice movement in New York was ramping up. Bautista and others in the environmental justice movement at the time hoped that the criteria would increase transparency of the city facility-siting process, and provide an “early warning” to communities whose neighborhoods had been selected for waste processing stations so that they might intervene. “The Charter Revision in ‘89 put land use in the hands of the City Council,” Bautista said. While NYLPI was able to prevent the construction of two sludge treatment facilities using the criteria as an argument, Bautista says that, overall, the criteria are too superficial in nature and too opaque in execution to be impactful. Bautista also points to the lack of penalties levied upon city agencies that do not submit upcoming facilities to the Citywide Statement of Needs; noting that there are no consequences for an agency that does not include plans to open a new facility in a neighborhood. For instance, the Fire Department submitted a site relocation proposal in the Statement of Needs for Fiscal Years 2016/2017 but did not do so for Fiscal Years 2017/2018. At the same time, in 2016/2017, Department of Homeless Services and the Administration of Child Services had no site proposals, but in the next statement, both agencies put forward multiple projects. Not enforcing a complete picture of new facilities in neighborhoods means that communities “never get an accurate view of what’s happening in their areas,” Bautista said. “We had three administrations where Fair Share was meaningless because the regulatory framework made it so toothless,” Bautista said, referring to Mayors Dinkins, Giuliani, and Bloomberg. A representative for the City Planning Commission confirmed that there are no punitive measures taken against agencies that fail to participate in the annual statement, but that checks and balances on siting decisions occur throughout the ULURP and public comment process. Often, it is left to City Council oversight and public pushback to a Council member or at a Council hearing to hold sway over these types of omissions. Despite high hopes at the outset, there is no doubt that the Fair Share Criteria have not proved as useful as early proponents had hoped. But, their influence is starting to be felt again in conversations around distribution of facilities. The perception and reality of inequitable distribution are a constant in headlines across New York, as evidenced by the defeated proposal for the homeless shelter in Wakefield, which would have oversaturated the neighborhood, and the agitation over the conversion of the hotel into a homeless shelter in Maspeth, Queens, where the city has limited such facilities. In both situations, the city has had to navigate local concerns while attempting to install services and infrastructure for a growing population. In the case of Wakefield, Council Member Andy Cohen believes Fair Share was definitely a contributing factor in the administration’s final decision. In an interview outside City Hall, he told Gotham Gazette that there is a tension between the city’s need to house the homeless and the needs of communities. “I think in order to maintain quality of life there just has to be balance,” he said, “and having a disproportionate number of homeless people being serviced out of one community, I think taxes the NYPD.” He cited as an example one of the shelters in the Wakefield neighborhood that he said had generated more than 500 911 calls within the first six months of opening. “The precinct is not able to service the rest of the...precinct if they’re answering all of these calls so that’s the kind of example of why I think it’s important that these facilities are spread out in a proportional and representative way,” Council Member Cohen said. Council Speaker Mark-Viverito ignited a firestorm of protest and earned quite a few applause when she spoke hopefully in her 2016 State of the City address of reducing the jail population of Rikers Island so significantly “that the dream of shutting it down becomes a reality,” and announced the creation of a special commission to be led by Jonathan Lippman, former Chief Judge of the New York Court of Appeals. The commission is reviewing the city’s entire criminal justice system, including the possibility of closing the island’s jails and relocating the detainees and inmates. DNAinfo reported in March that, contrary to earlier claims from the mayor’s office that the closure proposal was a “noble” but “unworkable” concept, city officials had begun examining several locations for new and expanded jails that might house the thousands displaced by shuttering Rikers complexes. As of October 20, Rikers held about 7,500 inmates, many awaiting trial, and other city jails off the island held about 2,200, for a Department of Correction headcount of 9,764, according to a DOC spokesperson. According to DNAinfo, officials identified possible locations in the Bronx, Brooklyn, Queens, and on Staten Island, “where two new jails — each housing as many as 2,000 inmates — could be built.” According to several proposals that have been around for years, existing detention centers could and should be expanded to also accommodate detainees if Rikers were to be closed -- something Mayor de Blasio has called a long-shot and a many years, multi-billion dollar project if it were to ever come to fruition. One site on the short list for a hypothetical new jail is Hunt’s Point, where a jail barge holding 800 prisoners is currently moored - and the very neighborhood Mark-Viverito held up as an example of an area already saturated with more than its fair share of burdensome facilities. “While I understand that we need to make strides in improving corrections infrastructure, primarily Rikers Island, the solution is not building a new facility in the South Bronx,” City Council Member Rafael Salamanca, recently elected to represent the area, said in an April press release, released in collaboration with State Senator Jeff Klein. City Council Member Antonio Reynoso, who represents Williamsburg, Bushwick, and Ridgewood, said in a statement that while he has not been able to verify that the city is considering using a National Grid site in his district as a jail location, “...if it were true, the proposal would need to go through public land use review, and I would never allow it to pass.” The Council is known to defer to the local representative on land use decisions. In 2013, then-Comptroller John Liu released a report that set out to examine the way the city chooses sites for homeless shelters, and to “determine if the City’s goal of transparency is being effectively achieved by implementation of the Fair Share Criteria.” The answer, in short, was “no,” but the report dove deep into the ways the complex process of siting city facilities is made even more convoluted and opaque when different kinds of shelters and shelter operators are in play. “Shelters are undoubtedly clustered in low-income neighborhoods,” the report stated. Using data from 2011, the comptroller’s office showed that “family and adult shelters were unevenly dispersed across the city,” with the greatest concentrations found in the Bronx, followed by Brooklyn, Manhattan, and Queens. Staten Island was not included, because its six shelters made the borough an outlier that skewed citywide results. The analysis is never as simple as being borough-based, of course, and there are specific communities that are at the heart of fair share issues. To this end, the report pointed out a litany of shortcomings, chief among them that a large number of homeless shelters are regularly not included on the annual Citywide Statement of Needs. Many DHS shelters are excluded, as are emergency shelters, which by nature are not anticipated, though potential sites could be identified earlier; as well as per diem shelters, “which are not City facilities” and therefore skirt a real public input process. Those exclusions, the report says, prevent communities from offering comment or intervening once a site has been chosen. The lengthy report contains a thorough critique of and suggestions for improvement to the transparency aspects of the Fair Share Criteria, but the driving conclusions were that “there is poor notification and limited community participation in decisions about siting family and adult homeless shelters” and that “clustering is occurring and that certain neighborhoods across the City have a higher proportion of family and adult shelters than others” - namely, low-income neighborhoods such as Bedford-Stuyvesant and Brownsville in Brooklyn, Fordham, Morris Heights, Belmont, and East Tremont in the Bronx, and Central Harlem in Manhattan. If the public notification and input process were improved, the report says, a more transparent process might create a more equitable distribution of facilities. The problems of transparency and clustering don’t seem to have improved significantly since that data was collected in 2011. In 2015, the Department of Homeless Services released data showing that the ten community districts with the most homeless shelters contain more shelters than the other 49 districts combined. Of those top ten districts, four were located in the Bronx. The other areas with the highest concentration of shelters were almost all low-income and predominantly non-white, including Manhattan Community Boards 10 and 3 in Harlem and the Lower East Side, respectively; Brooklyn CB3 in Bed-Stuy; and Manhattan CB11 in East Harlem. DHS takes a number of factors into consideration when selecting a new site for a homeless shelter -- rating the bid made for the site, whether the building has the appropriate documentation, including a Certificate of Occupancy, whether it complies with requirements of the state Office of Temporary and Disability Assistance (OTDA), timeframe of availability, potential capacity and saturation, among others. The OTDA also has to approve the expansion of an existing shelter. In non-emergency circumstances, the city ensures that elected officials are informed of a shelter opening at least 45 days in advance. DHS now also creates a Community Advisory Board for every new shelter. These boards, comprised of appointees of local elected officials and community members, hold monthly meetings with DHS staff, the shelter operator, and NYPD to discuss any pertinent issues. However, the regulatory void in which homeless shelter siting operates became apparent in 2014, when DHS successfully opened a new homeless shelter for adult families without children at 56-66 Clay St. in Greenpoint, Brooklyn, despite protests from local officials and community members that a public review process had not taken place. Assembly Member Joseph Lentol pushed back, citing the four existing shelters in his district, and asking city officials to consider the Fair Share Criteria before making a final decision. "For more than 40 years we have been our brother’s keeper, and we continue to accept that responsibility on the condition that we are not being unfairly singled out to carry this burden," Lentol said in a letter to Department of Homeless Services about the conflict. "Other communities are not carrying this same burden because Community Board 1 is unfairly carrying this load." But the shelter on Clay Street was not subject to the Fair Share Criteria, or to any lengthy public review process. It was instated as an emergency shelter, for which DHS must only give seven days notice. While DHS acted legally, the shelter felt as though it had been “smuggled in by the dead of night,” Board 1 chair Dealice Fuller said in a letter to Mayor de Blasio last year. On August 17, Mayor de Blasio announced major planned reforms to the city’s commercial sanitation industry, which would seek to reduce truck traffic and emissions, increase recycling and promote environmental justice by creating commercial waste zones that are each served by one private sanitation company. The plan was praised by the Transform Don’t Trash NYC coalition, an environmental justice community group that has long advocated against the problem of waste facility clustering in the city. While city officials are making and eyeing significant strides toward reducing the amount of waste New York residents and businesses produce, processing and transfer stations are concentrated in a handful of low-income communities populated predominantly by people of color. 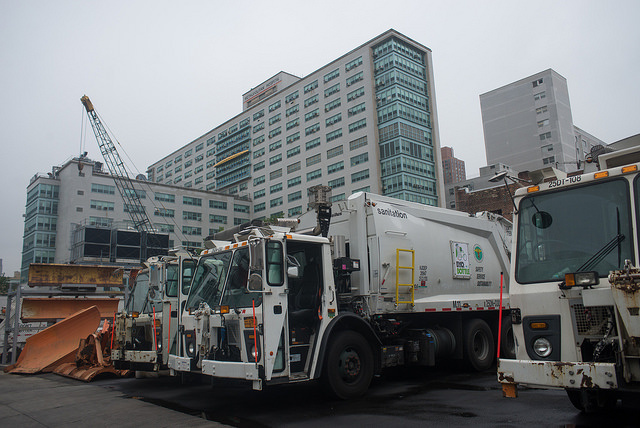 After collecting data for both city-run and privately-owned waste collectors, the report authors found that 75% of all waste handled in New York City is trucked to transfer stations in just three outer-borough neighborhoods in North Brooklyn, the South Bronx, and Northeast Queens. The 4,000-plus diesel trucks that transport waste to those facilities each day emit exhaust, increase traffic congestion, and add wear and tear to roads, according to the report. The study found that the trucks’ emissions alone have a significant negative impact of air quality in neighborhoods where waste facilities are clustered. While de Blasio’s new commercial sanitation plan will address these issues, there is no indication if it will also look at the Fair Share Criteria to site new waste management facilities. In March, the New Harlem East Merchants Association wrote a letter to the Department of Sanitation, demanding that the department reconsider its decision to open a sanitation garage in a residential neighborhood on 3rd Avenue, about 1,200 feet away from another garage on East 131 Street, and in close proximity to two schools and a new cancer treatment facility. According to a statement from New Harlem East Merchants Association, the addition “would place an unfair burden on the East Harlem community,” which already struggles with an asthma rate twice that of the city-wide average (asthma rates in the nearby South Bronx are also quite high). The city has not indicated that community protest will prevent a second garage from going up. However, where the Fair Share Criteria have failed, local legislators are pursuing alternative projects and policies to prevent low-income communities from handling the vast majority of the city’s waste with a mind toward more equitable distribution. Building on the 20-year Solid Waste Management Plan (SWMP), which has an environmental justice focus and was adopted by Mayor Bloomberg and the City Council in 2006, City Council Member Steve Levin of Brooklyn introduced a bill in October 2014. Intro. 495, also known as the “Trash Cap,” would cut the daily waste processing capacity in the three most-burdened neighborhoods -- North Brooklyn, South Bronx, and Northeast Queens -- by 50% of the daily trash volume they currently receive, according to Council Member Antonio Reynoso’s legislative director, Lacey Tauber. It would also cap the permitted capacity of waste transfer stations at 10 percent of the average citywide capacity. Reynoso, who is chair of the Council’s Committee on Sanitation and Solid Waste, also represents the district with the highest concentration of waste facilities: parts of Brooklyn including Williamsburg and Bushwick. Under the trash cap bill, all community districts with solid waste transfer stations would be capped, but not every cap would be the same, Tauber told Gotham Gazette. The bill considers any community district handling more than 10 percent of the city’s waste as overburdened and seeks to ensure that community districts that aren’t already over that threshold are capped at 10 percent and cannot be pushed over it. “The [10 percent] cap on citywide waste ensures that lessening the burden on one community does not simply transfer that full burden to another similar community,” Tauber said. Tauber added that pairing prevention of over-saturation of waste facilities with a clear alternative is key to not sacrificing equity in one community to benefit another. “If we say you can’t bring it here but don’t specify where it can go, that directs waste to other low-income communities of color,” Tauber said. After negotiations with the de Blasio administration about the bill, which had a hearing early in 2015, it was amended to increase the cap from the original proposal of 5 percent to the current 10 percent. The bill has not yet been voted on in committee. Another way to decrease truck traffic and associated ills is through the use of marine transfer stations, or MTS, where waste leaves the city via barge, decreasing traffic and consolidating the process. The city is opening MTS in Queens, Brooklyn, and, perhaps most famously, on 91 Street on the Upper East Side. According to the NYC Environmental Justice Alliance, the latter, a wealthy and well-connected neighborhood, has funneled hundreds of thousands of dollars into an opposition campaign. Nevertheless, construction is still underway, and proponents of MTS believe the three will offer significant relief to overburdened communities. “It will help decrease traffic, congestion, pollution - everything that the trucks bring into those low-income neighborhoods,” Tauber said of the Upper East Side MTS. Yet, the MTS currently only deal with the residential waste under the jurisdiction of the Department of Sanitation. Incentivizing private truck companies that pick up waste from businesses and restaurants is another challenge that the city appears to be targeting through the neighborhood zoning plan. This model allows the city to consolidate truck traffic and regulate labor standards, truck emissions, and more. The proposal that the de Blasio administration put out has a long way to go before becoming law. Despite noble intentions, the Fair Share Criteria does not achieve the kind of transparent public input process and equitable city landscape sought by its supporters. While Speaker Mark-Viverito promised in her February State of the City address that the City Council would “empower neighborhoods by working with our partners in City and State government to create tools and improve opportunities for public input in the Fair Share process,” no specific legislation has been put forth. In the August interview with Gotham Gazette, she said the Council was exploring the issue, and may put out a paper on it. City Council Member Brad Lander, long a proponent of progressive city planning practices, has clear ideas about how to revamp the criteria. “Step one is to provide more transparency on both the existing siting of various forms of municipal infrastructure and services that are covered by the fair share rules, and more transparency on each individual application so it will be possible to really evaluate whether it is fair or not fair,” Lander told Gotham Gazette in an interview. Second, Lander said that the criteria have to be updated. “If City Planning wants to do that, great. But if not, we need to step forward and push them to do it,” he said. “Developing a system that has at least a thumb on the scale toward more equitable distribution: that’s the ultimate goal,” Lander said. The City made significant moves in this direction in April, according to Lander, when the administration quietly resurrected the formerly-annual Social Indicators Report. Though the annual report was mandated in the same 1989 Charter Revision that created the Fair Share Criteria, this is the first report to be published by a Mayor in a decade. Lander says that while the City Council works on how to update and improve the Fair Share Criteria, the Social Indicators Report is a valuable and promising tool. “It’s a good, strong step forward,” Lander said. The Council member did not indicate whether anything on fair share from his office or the Council in general should be expected any time soon. Eddie Bautista, executive director of the New York City Environmental Justice Alliance and veteran in the fight against clustering waste facilities in low-income neighborhoods, is cautiously optimistic. “What would make it meaningful would be to go back to the original concept: transparency and a full accounting of the burdens and lack of benefits in each community,” Bautista said. Note: this story has been updated to reflect amended language in Intro. 495, the "Trash Cap" bill.